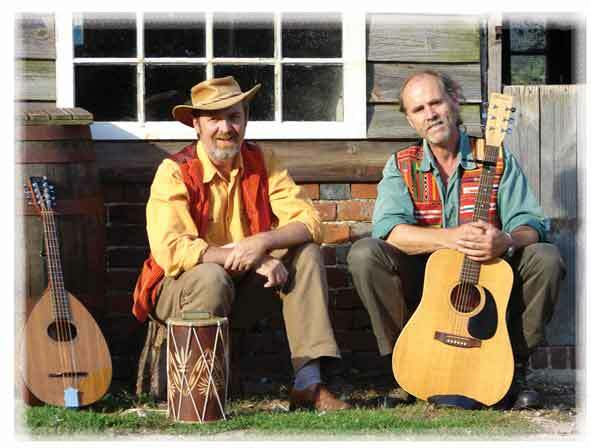 THE BUNDELL BROTHERS  An interview by Peter Doggett. Second-hand record stores are full of unnecessary records by unnecessarily prolific artists, whove kept making albums for decade after decade because they dont know what else to do. So its refreshing to discover two Hampshire singer-songwriters who helped to create one of the legendary folk-rock records of the mid-70s, and who then waited a quarter of a century before unleashing another album on the world. After that, the Bundell Brothers  Ivor and Kevan - positively raced to complete their second record as a duo, which was released late last year. Like its predecessor, it sidesteps both the traditional folk scene, and the emotional exhibitionism that you often associate with the singer-songwriter tag. Instead, both 2001s Secret Lives and 2006's Stood On The Shore occupy a unique place in the story of Southern acoustic music, combining history, humour and human insight with rich, mainly acoustic textures. Their records feature not just the inevitable guitars, but also mandola (Ivors creative inspiration), penny whistle (Kevans current joy), jaws harp, harmonica, keyboards and a variety of percussion  all topped by vocals solo and in harmony. Besides Wordsworth and the Incredible String Band, the Bundells background provided another, more localised form of influence. We were brought up going to the Baptist chapel, Kevan says, going to church and singing hymns. Our mum is a piano player, who has played harmonium in chapel all these years, and she was also in the choir with our dad. So we imbibed hymn tunes from an early age, Ivor adds. Both brothers have since soaked themselves in the Baptist hymnal tradition. Kevan explained: Ira D. Sankey  the man who compiled the book, Sankeys Sacred Songs & Solos  was a 19th century hymn collector and adaptor in the United States. His music was very much part of the tradition which our parents used for their choral work. This was proper revivalist stuff. Ivor carries on the thought: And then there is the English Hymnal, and the New English Hymnal. Around the beginning of the 20th century, Vaughn Williams went through many traditional tunes, and tidied them up to be used as hymns. The effects of this schooling can be heard on Stood On The Shore, in the form of Ivors recasting of Who Would True Valour See, to the tune of Monks Gate. None of this was obvious to anyone who heard the Bundells earliest live performances, at Prices Schools occasional folk concerts. At some point in the mid-to-late 60s, Kevan recalls, boys were allowed to put on a concert for the first time. The headmaster, Eric Poyner, was legendary for his dislike of pop music; he apparently told a colleague that the guitar is the instrument of the devil! But folk music was just about permissable, presumably because of its traditional heritage, and so Prices started to stage annual concerts. By the early 70s, when the Bundells began to perform, trad tunes had given way to original material and covers in the singer-songwriter mould. As the family tree on their website reveals, the Bundell saga began when Kevan, Paul Gateshill and several friends formed Lonene. Not to be outdone, Ivor and his fellow editors of the school IVth Form magazine, the Black Lion, responded with Autumn Stone. Various groupings followed  Spirits Rebellious, PINT, Grass Roots  until by 1975 unsuspecting audience members were unlucky enough to experience the current writer and Ivor murdering Beatles and Paul Simon tunes in not-so-close harmony. The songs on Stood On The Shore are credited to both brothers, although in the great Lennon/McCartney tradition you can usually identify the original author by the lead vocalist. So it is Ivor who contributes another priceless slice of history, in the form of Mr Mitchells Angel, a touching tribute to the man who created the World War 2 fighter plane, the Spitfire, and the rural vignette of Moving The Meander; and Kevan inhabiting the character of Wandering Jack and the poignant Slip Away. Within their Englishness, the Bundells are definitely  defiantly, even  the product of the South. In the USA, the South immediately conjures up an exotic collage of images. But what does it mean in this country? There isnt the same strong, local identity, Ivor concedes. Its much more amorphous. The whole of the South of England has a much more fluid, socially mobile identity, than the more settled communities in the North. People here are being pulled in two directions  up towards London, and down to the coast, and then abroad. In their music, the Bundell Brothers are trying to capture that imprecise quality of Southern-ness, through songs that are rooted in local experience, ancient and modern, traditional and freshly minted. Inadvertently symbolising that shifting Southern identity, Kevan and Ivor continue to work outside the established network of folk clubs. We tend to run our concerts for charity, once or twice a year, Ivor explains. Enough people come to make it worthwhile  I dont mean financially, but as an event. It would be nice to play more regularly, but we have to make a living elsewhere. Kevan confirms that, This is something we do in our spare time. So were not out there on the circuit, being part of a particular scene or movement, or even being very knowledgeable about whats going on. They could almost be characters in one of their own songs, proudly pursuing their own musical course regardless of the prevailing winds. Those who are lucky enough to have heard and enjoyed their music will hope that the breeze blows them onto a nearby stage, and back into the studio, before too many more years have passed. Peter Doggett is one of the UK's leading rock writers and journalists. He was editor of Record Collector magazine for fifteen years, and currently writes for Mojo and Q among others. He is also author of Are You Ready for the Country? (Viking), an authoritative history of country rock, and of biographies of John Lennon, Lou Reed and of 1968 etc.